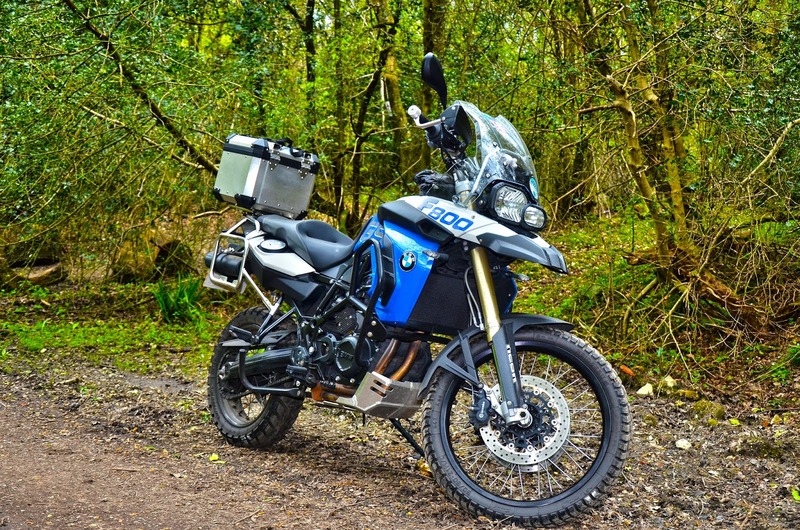 I started this blog when I bought my first dual-sport/adventure bike on 1 March 2012—my beloved F800GS Trophy in a fetching desert blue and alpine white colour scheme. BMW gave me a very fair part-exchange price for my Honda Hornet which was 4 years old at the time but only had about 10,000 miles on the clock. I took very good care of that bike and it still looked showroom fresh after a good cleaning and waxing. Along with the Hornet, I delved into my savings account once negotiating the price of the F800GS—and paid for my very first brand new BMW in full by direct debit! There was something satisfying but slightly odd about getting a new bike and not having any monthly payments. After getting to grips with handling such a large bike, I couldn’t stop raving about it. An absolutely cracking machine. The F800GS is not the very best bike in any one single area, but it all comes together to become one of the very best all-rounder bikes overall. It is a well mannered bike on road and easy to surprise sport bike riders through the curves as it can plough through corners quickly and with confidence. The bike isn’t powerful enough to get you in too much trouble, but it’s much faster than you think. Strong torque means it has the potential to be an absolute hooligan bike (effortless wheelies!) if you want it to be. Handlebars are just the right height when filtering to go over top of car wing mirrors, and underneath van wing mirrors. The narrow chassis squeezes through traffic as easily as a scooter. Off road, once you get it in your head that this isn’t intended to be a featherweight trials or enduro bike, it will take you pretty much anywhere you want to go. Treat it with respect and sanity in the dirt and it covers ground with confidence, quickly and comfortably. With the right tyres, it is even well mannered in mud and sand. The F800GS is great for long journeys if you stop for a few minutes every couple hours to get the blood circulating through your bottom—the seats (stock and optional ‘comfort’ seat) leave a bit to be desired. Range is very good considering the 16 litre tank size—this translates to about 250 miles per tank on a long journey. BMW has worked out the quirks which plagued a handful of early models—mine has had zero problems in 14,000 miles. Servicing direct from BMW is very reasonable (£150–200 every 6,000 miles, roughly half the Honda Hornet’s servicing costs). The build quality is peerless—as good as the best from Japan. After more than two years of ownership, it still excites me to ride this bike—it is the motorbike equivalent of a loyal sheep dog. Light weight (for its class) means the modest power gets to the road effectively. Smooth power delivery and generous torque make the bike deceptively quick. Even on knobblies, handling is quick and the bike is easy to flick through corners. Steering/suspension geometry are great for city use due to exceptional low speed stability—narrow chassis perfect for filtering. Top of class fuel economy with 60mpg easy to attain on longer journeys even 2-up with full load of luggage. Handling not spoilt when carrying a full load. Soft, long travel suspension perfect for war-torn UK road surfaces. Narrow stock seat great for off road use, not so great for long journeys—my bottom gets numb every couple of hours. Comfort seat option a demonstration of German humour—while better than the stock seat, it is not very comfortable. Stock and optional touring windscreens not very effective at high speeds—adding an aftermarket extension would make high speed travel exponentially more relaxed. Front end dives significantly under hard braking. This can be mitigated by using the rear brake heavily at the same time which causes the bike to chew through rear pads (although these are cheap as chips to replace at only £25/set from BMW). Do you ride an F800GS? Let me know your experience in the comments below. End of the road for the K1300R? Update: BMW S1000XR coming soon?